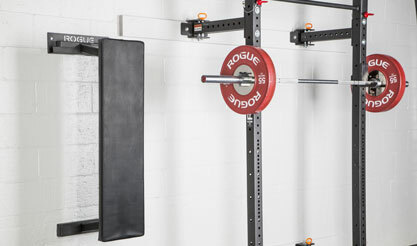 A Rogue original Fold Back Rack is built with two 3X3” 11-gauge American steel uprights, laser cut in Columbus, Ohio, with Westside hole spacing through the bench/pull area, and 2”-on-center spacing above and below. All steel is powder coated in the Rogue factory for a durable finish. 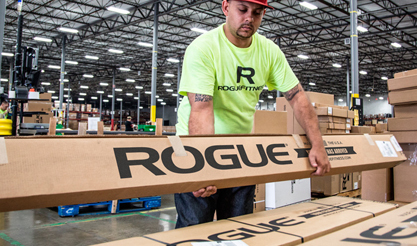 For optimal support, Rogue recommends adding a pair of stringers to your Fold Back Rack order via the menu on this page. Our custom-compatible stringers are made from laser-cut and formed 11-gauge steel and finished in our texture black powder coat. They measure 59" long x 10-1/8" tall, and extend 13/16" off the mounting surface when installed. 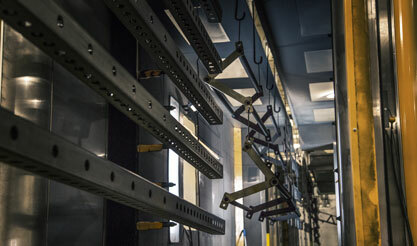 One stringer is used to mount the top hinge brackets and the other for the bottom hinge brackets. You can learn more about our Fold Back Rack Stringers in the Key Features section below. Each unit comes standard with a Quick-Attach Pull-Up Bar, (4) mounting brackets for installation + all necessary hardware, a set of J-cups, and (4) detent pins. Having holes 2” on center allows for some choices in mounting the swing arms, which can be important if you need foundation clearance. Customers can also choose to add a pair of Fold Back Rack Stringers to their order at an additional cost [Highly Recommended]. 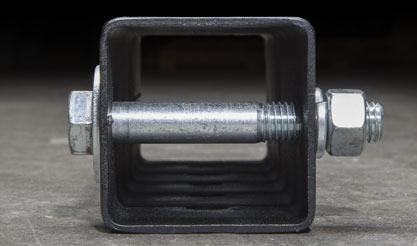 The 11-gauge steel stringers feature pre-cut slots, allowing users to mount them to a standard wood stud wall (4 studs required for installation). 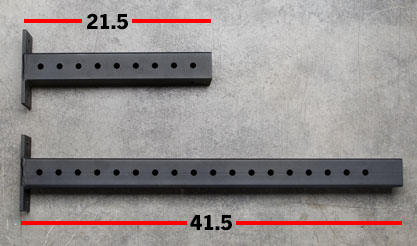 Our stringer pair comes with all required hardware (16-3/8" x 2-1/2" black wood lags and washers), but any customers attempting to secure the stringers to a wall construction other than wood stud will be responsible for acquiring the correct hardware. 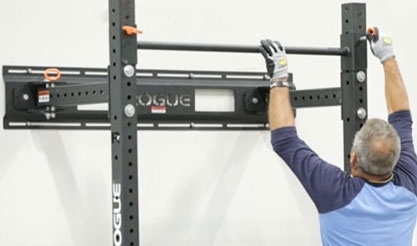 Rogue RML-3W Fold Back Wall Mount Rack is rated 4.9 out of 5 by 148. Rated 5 out of 5 by BryceAZ from Awesome fit and function in the garage! I finished installing the RML-3W this weekend and I couldn't be happier. It took me much longer than many people have mentioned in other reviews but I think that's because I did the whole thing myself. My motto was "measure 1000 times, drill holes once" and that paid off! 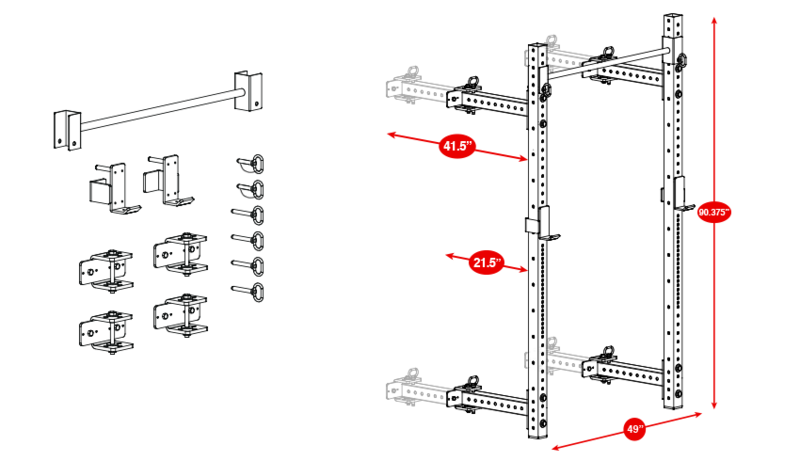 The instructions were easy to understand however if you have a large concrete baseboard or trim at the bottom of your wall you may have to modify the vertical floor to bracket measurements as I did. Everything else was very easy to follow and complete. An impact drill is very helpful but not necessary, everything can be done with a socket set if needed. Can't wait to get a few accessories to really make this thing perfect. Rated 5 out of 5 by sunpadre from Awesome Equipment! I purchased this to start up my home gym as the core piece of equipment. It was more than I wanted to spend but it's totally worth it - get the stringers. Shipping was super fast, installation was pretty easy even with a couple small mistakes I made related to having to work around a cleanout pipe on my garage wall. I will say that measuring to take in account the slope in the garage floor adds to the install fun. I installed this myself and it was a workout in itself! It's a beast and super strong. The 21" version is perfect as I can still park a car in front of it without folding it up. I'm really enjoying this quality equipment and recommend it! Rated 5 out of 5 by Dan11589 from Excellent Rack! This rack is perfect if you are short on space. It's solid and allows me to do what I need to do without worrying about stability or safety. There are other reviews on here that give good advice on mounting and setup. My only piece of advise is to be aware that the uprights are 90", but once you put the plastic caps on the bottom they are 90 1/2". The mounting brackets for the pull up bar are 6" and you have to slide it over the top of the uprights. If your ceiling is 8' like mine you will have a problem mounting the pull up bar. It's just something to be aware of. We had to get a little creative. Rated 5 out of 5 by Bagger from Sweet Setup How to fit two cars in a 20' wide garage and still have a workout area? This is the solution and as others have said, the rig is solid. I did the setup solo and found the instructions sufficient. Stringers are 2x6 and lag bolts are 1/2" x 4". In hindsight I think 2x8 would have been a better choice so the lag bolt can be spaced top-bottom farther allowing more space in between for accessories. The big deal for me is both cars still fit and even though the truck is outside most of the time, when bad weather hits I can quickly break everything down and get the cars in. Nice job Rogue. Rated 5 out of 5 by MrLove from Awesome Product! Not going to say anything different from anyone else, just taking the opportunity to comment on how well built and sturdy this thing is. I'm 6 foot and 220lbs and this thing does not care. It doesn't budge on pull-ups, muscle-ups, heavy loaded squats, you name it, it can handle it. Very impressed with my purchase. I got the matador and spotter arms along with the rack for more versatility in my workouts. The personnel at Rogue have mos def raised the bar on this one. AWESOME PRODUCT!! Rated 5 out of 5 by Heimdall from Love it! I set this up about a week ago, it wasn't all too difficult to do alone, but I definitely recommend putting it up with a buddy. Very easy to piece together. I mounted it with 2x8 and they are holding up fine. I weigh around 210 and I have been rocking the pull up bar as hard as I can. All in all the rack has been sturdy and shown no signs of issues. The only thing is that I was worried the 21" was going to be too small, so I ordered the 41" and it is a space eater, and actually kinda hard to store away in my garage but that's bc of limited options for installation area. I'd go wit the 21" and it'd be more than ample. Rated 5 out of 5 by Guchi from Better than I expected... Super Stout I quickly received the RML-3L from Ohio to CA and I set it up the next day. This was the only rack that would fit my mini-gym. The pull-up bar is a huge bonus and I'm sure it will see much use. The rack is far more secure than I thought. The main legs support all the weight with ease and I'm sure it will last a very long time. Best thing is it's also not permanent and I can move it if need be. With all the attachment points I'm going to have to be on the look out for dip bars or a set of rings. I'm very pleased with the construction and the directions were super easy to follow. I mounted it with 2x6 stringers and used 1/2" x 2" lag screws. I mounted the stringers across 5 studs but I think that was overkill as they are only for support when the legs hold the weight.